Not your daddy's Zaxxon, or your mama's, for that matter. When we first heard that Sega intended to resurrect the 1982 arcade smash hit, Zaxxon, with a sequel, visions of some isometric romp blasted its way into our heads. The original was highly praised for its pseudo 3D graphics. It was a pioneer, a game worthy of pomp and circumstance reserved for some of the best shoot-em-ups in history. This was the company's chance to make a big impact on iOS and Android with a shooter that would redefine the genre. Instead, the publisher chose to go with Temple Run in space. 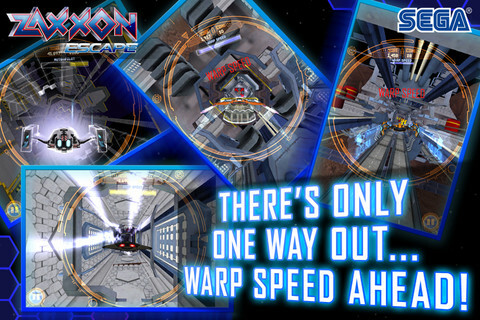 Yes, Zaxxon Escape ($0.99) is an endless runner that plays almost exactly like the countless titles that have flooded the App Store, except instead of guiding some bozo through ancient ruins, or a secret agent past laser beams, you maneuver a ship through Zaxxon's fortress, a twisting maze filled with tight corridors, where making split-second decisions are the difference between forging ahead or bursting into a fire-laden wreck. Forget about the isometric perspective. Here, you view the action from behind the spacecraft. Arcade stick? Nope. 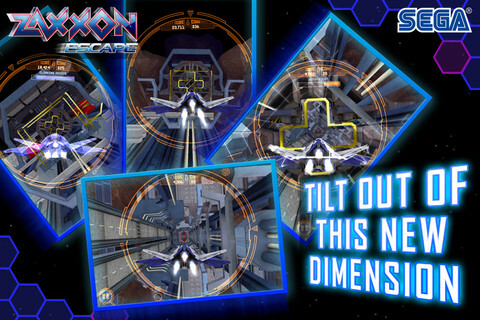 The entire game works using tilt controls, with the occasional swipe to change direction and tap to shoot for good measure. Also, and similar to other endless runners, you have a variety of power-ups that make the game easier. Helpful shields let you pass through objects unscathed, while the Auto-Pilot makes the ship travel faster while taking over the controls. You'll also find score multipliers, coin bonuses, decals and other ships to unlock using virtual coins collected during play. Don't have enough? It's cool. Sega is more than happy to sell more via in-app purchase. And what of those tilt controls? Well, it's a mixed bag, really. Prepare to tackle a learning curve before getting the hang of things, and even when you do (or think you do), the game throws ridiculous situations your way, like tilting the iPad 360 degrees to avoid smacking into walls. Sorry, but the iPad is much too big for that. In other words, prepare for lots of cheap deaths. Now up until this point, it sounds like we loathe Zaxxon Escape, yes? Turns out, quite the opposite. While not in love with Sega's creation, it does possess an addictive pull, where we just can't help ourselves from having another go. Perhaps it's the constant desire to smash those high scores, or maybe it's our insatiable lust for Z-coins. It also helps that the game looks decent, with elaborate 3D corridors that bring to mind the epic Millennium Falcon trek through the Death Star in Return of the Jedi. Sega even places flames around the outer edges of the screen, suggesting there's something big and nasty behind the ship. That said, Zaxxon Escape is like fast food. Satisfying for a little while, but perhaps not the best choice for your dollar. We had some fun, but ultimately, this title represents a missed opportunity for Sega, as there's a good chance this game will be forgotten a couple weeks from now. A shame, considering how popular Zaxxon was back in the day. What's Hot: Intense endless flying action, a variety of power-ups and ships to unlock, detailed space station. What's Not: Weird tilt controls, rotating the iPad 360 degrees is a no-no, still missing iPhone 5 screen support, doesn't include original Zaxxon.